Well this truly is an awful photograph even by my standards. I’ll direct you immediately to the VeganYumYum blog where not only are the recipes brilliant but the photos are beyond my wildest dreams. The only annoying thing about the site is that if you want to print a recipe you either need a ream of paper or a huge amount of copy and paste skills. I was very excited about her book, and I’m not going into the rights and wrongs of that here. Enough to say I really hope she finds a publisher she is happy with because I’m sure it’ll be a great book eventually. I have made gnocchi many times, both vegan and non. I was really intrigued by the 2 different sauces in this one though so I decided to give it a go. I was really proud of myself because while the potatoes were in the oven I also roasted pumpkin AND made VeganYumyum seitan for potstickers (to come!). Way to make the best use of one oven! I blame myself for the gnocchi failure and not the recipe. I was so intent on the gnocchi being light and fluffy that I added so little flour that I pretty much ended up boiling neat mashed potato. Naturally this ended up with pretty loose gnocchi…. Still, the combination of the powerful sharp thyme vinaigrette with the smooth cashew cream was a complete winner. I just need to add enough flour next time!! This entry was posted in veganmofo and tagged veganmofo by efcliz. Bookmark the permalink. Pretty plate! And the two sauces are an intriguing approach. Ace plate. I’ve never even tasted gnocchi before – but yours looks yum. you might think that’s an awful picture but it made me hungry 🙂 I haven’t made lolo’s gnocchi but now I need to. i’ve never made gnocchi..it seems a little labor intensive, but i’ve always wanted to anyway! this sounds totally delicious. and your plates are cool! The 2 sauces approach sounds really delicious. 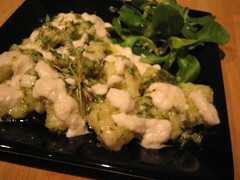 gnocci is worth the effort, so please don’t give up ;-). I use the recipe in Vegan with a vengeance. Pretty foolproof.